(a) Place the vehicle in the following conditions. The area around the headlight is not deformed. The vehicle is parked on a level surface. Tire inflation pressure is the specified value. A driver is in the driver's seat and the vehicle is in a state ready for driving (with a tank full). The vehicle has been bounced several times. (b) Check the headlight aiming. Prepare a thick white paper. Stand the paper perpendicular to the ground at the position 9.84 ft away from the headlights. Ensure that the center line of the vehicle and the paper face forms a 90-degree angle as shown in the illustration. Draw a horizontal line (H line) on the paper, showing where the headlights should strike. Draw a vertical line (V line) to where the center line of the vehicle is to be. Draw 2 vertical lines (by connecting the low and high beam center marks) to where the both headlights should strike (V RH and V LH lines). 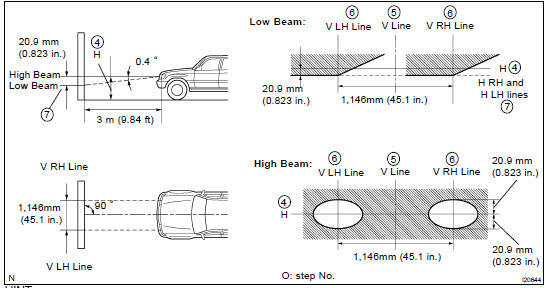 Draw a horizontal line (by connecting the both low beam center marks) to where the headlights should strike (H RH and H LH lines). HINT: The H RH and H LH line is 0.4 below the horizontal line (H line) of the light axis. Check that the headlights properly strike the position shown in the illustration. If not, adjust the lights in the vertical direction. HINT: As shown in the illustration, adjust each aim of the RH and LH lights. 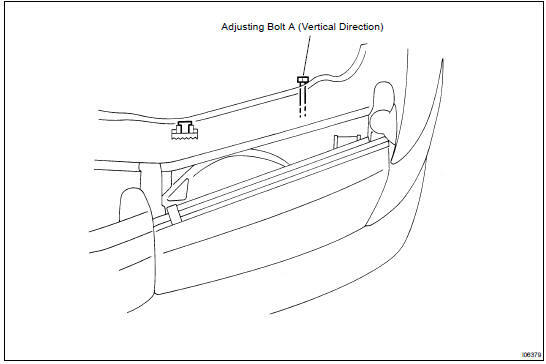 (c) When adjusting it in the vertical direction: Using adjusting bolt A, adjust the headlight aim to within the specified range.